The origins of the Weed Smackdown date back to plans to remove the Marmot dam, which came down in 2007. This historic event prompted area agencies and partners to work together to restore salmon habitat in the Sandy River. For the first time in nearly a century, salmon could now swim freely from the mouth back up to the headwaters to spawn. The Sandy River Watershed Council and the Weedwise Program at the Clackamas Soil and Water Conservation District (CSWCD) are working to protect these investments by ensuring noxious weeds don’t take over the habitat that has been restored. 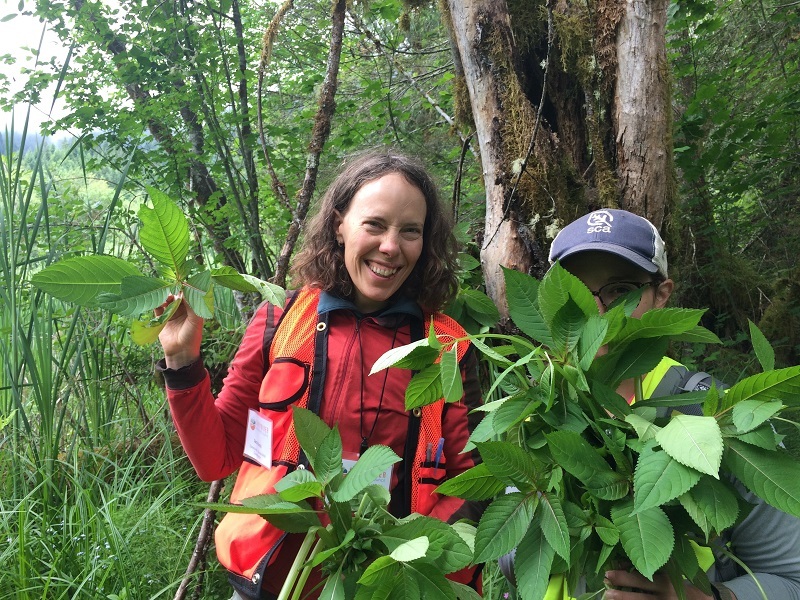 Watershed Council staff survey for a “dirty dozen” list of noxious weed invaders, species qualifying for “Early Detection and Rapid Response” (EDRR) status. EDRR programs are based on the premise that more recent invasions can be controlled whereas more established invasive plants like English ivy, Himalayan blackberry, and Scotch broom are too widespread for regional control. On the list of high priority weeds for early detection and treatment is Policeman’s helmet, a deceptively enticing garden escapee. This streamside invader grows up to ten feet tall, producing white to purple flowers atop reddish stems throughout the summer. Exploding pods disperse thousands of seeds per plant up to 15 feet, aiding its spread and sending seeds downstream. 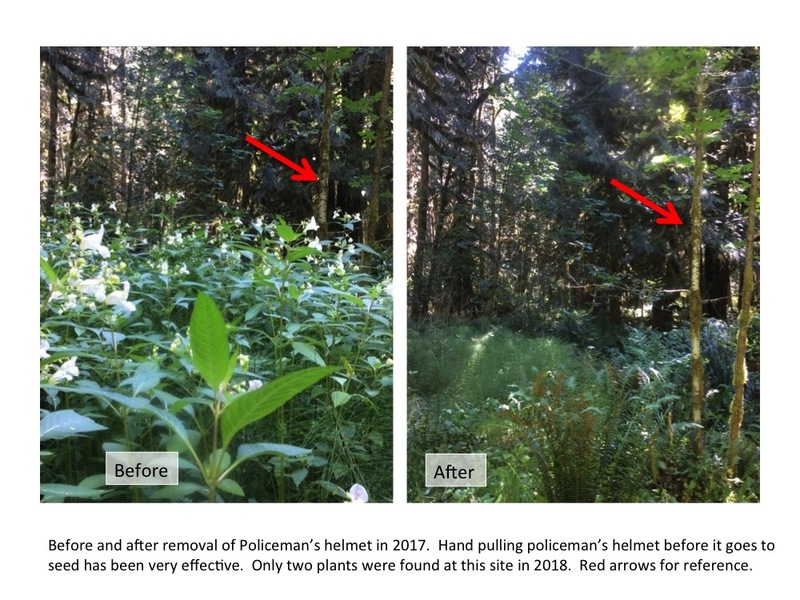 Where it takes hold, Policeman’s helmet can dominate other native forest plants, degrading critical river habitat. With sightings throughout the developed sections of the Salmon River, partners worked quickly to identify and treat infested areas to prevent the spread of Policeman’s helmet farther downstream. In 2017, youth conservation crews hand-pulled all major known infestations along the Salmon River for the first time since the project’s inception. Surveyors found very little regrowth in these areas in 2018, and will monitor these sites for 3-4 years until the seed bank is depleted. Given the success on the Salmon River, the Smackdown is turning its attention to Hackett Creek, upstream of the Sandy-Salmon River confluence, where infestations of Policeman’s helmet and some Japanese knotweed have been reported. The most critical component to the success of this project is the participation of willing property owners. Weeds know no boundaries and spread from one parcel to another. Properties in high priority areas near waterways and existing infestations are eligible to sign up for the voluntary Weedwise program through the Conservation District free of charge. Residents interested in learning more about the program should see https://conservationdistrict.org/programs/weedwise or contact Sam Leininger at the CSWCD: Samuel Leininger <sleininger@conservationdistrict.org> 503-210-6000. Community members can also look for posters identifying EDRR species in the Sandy and Welches area and can report findings to the Oregon Invasives Hotline 1-866-INVADER.